Last year European investment volumes were on decline not least due to political reasons: the turbulent political year of 2016 gave us Brexit, elections and referendums all across Europe (Italy, Austria, France), directly influencing the stability of financial systems and caution of investors. Similarly in the US: the elections, as the period of political uncertainty has influenced the investors on the other side of the Atlantic, too. However, when looking east, political stability in the Asian – Pacific region brought about the complete opposite: a lack of significant political events and turbulences gave the impression of economic stability. This fact directly reflected on the upward trends in Asian FinTech ecosystem investing activities. So how did we get to where we are now? 2015 has brought us plenty in terms of innovation and investing activity within the area of financial technology, the developments in the year behind us did not pick up such a fast pace. In 2015, we witnessed the strong emergence of innovative financial services delivered through a blend of various channels, combining various platforms and technological tools: the terms such as blockchain, API or POS became closer to the customer and in a way part of a daily conversation. These innovations have been fuelled by huge investment injection of $46.7 billion in value on global level. 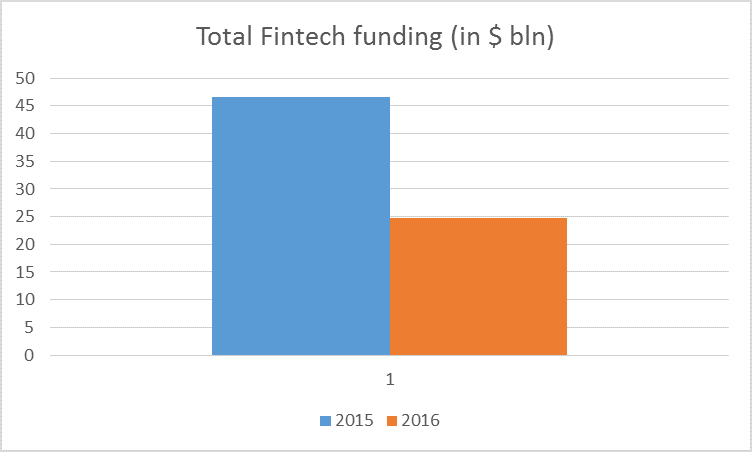 However, according to KPMG’s analysis of 2016, the FinTech market shows signs of slowing down. The decrease of almost 50% brought the investment value on a total of $24.7 billion. Banking/Lending has been the dominant segment when it comes to the number of companies raising funds (29% of companies that raised funds belonged to this segment). However, the segment of Payments/Loyalty/E-Commerce is the one where the total funds raised value is highest. 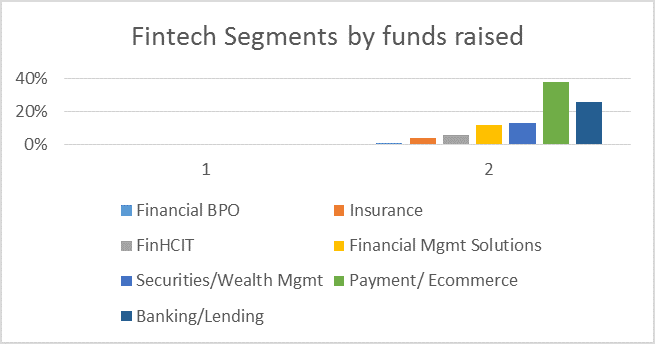 Companies categorized in this market segment have raised 39% of total funds raised by the entire Fintech industry in 2016. 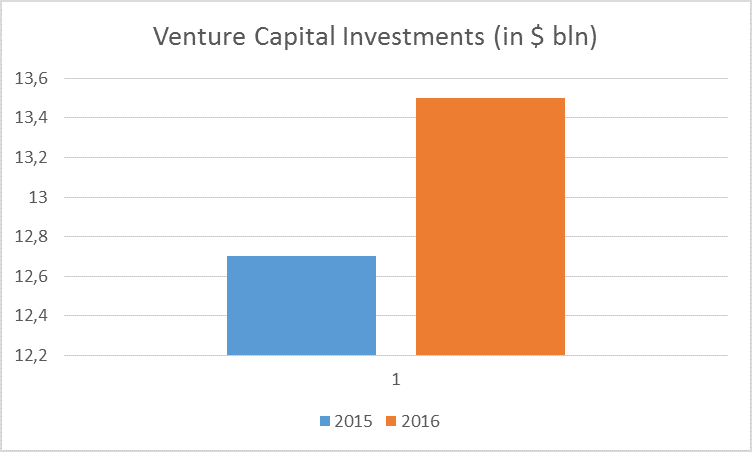 When analysing the structure of financing deals, the increase in venture capital activity is noticeable in comparison to 2015. According to KPMG, M&A and PE FinTech deals dropped considerably in 2016, while the venture capital investments reached $13,5 billion, even more than $12,7 billion in 2015. The reasons for such a boost are mostly three gigantic financing rounds in China. The funding round to Ant Financial that occurred in second quarter last year was $4,5 billion heavy. Besides Ant, two more historic financing rounds, each over $1bn, significantly increased investment numbers in China. Luf ax.com – $1,2 billion and JD finance – $1 billion. After these three giant investment shots, China outpaced the US for the first time with $7,7 billion in total value of deals (28 in total), with an 84% increase in comparison to 2015 ($4,2 billion). Except Markit’s $5,5 billion merger with HIS, there were no significant IPOs in 2016, either. The expectations are that the trend will pick up in 2017, as we have more mature companies in the market. The most active FinTech investor was fund and accelerator 500 Startups with 39 investments. In June, they announced raising a $25million separate Fintech fund for investing in early stage companies globally. KPMGs report found that the last quarter of the year showed some revival of the investing activity. The VC funding increased from $1,9 billion to $2,1 billion between third and fourth quarter of the year, though still not near the previous year’s numbers. On the American continent, VC investment revolved around $1,1 billion in Q4 ’16, not deviating too much from the previous year’s results for the same period. In Asia, VC funding jumped to $680 million after a year’s low of $200 million in third quarter. The rebound was mostly driven by a $ 384 million deal in the last quarter. Europe has stayed relatively stable, sitting on $319 million of investments in the industry. This result still remains lower in comparison to the same period in 2015 (around $350 million). Whilst we only know what the future holds once it becomes our present, we can do our best in predicting it by shaping it.